Hi, friends! Umm, can anybody tell me how it became the last week of July?! Where has this summer gone? With family visiting and trips being made, our weeks have flown by! It was nice to slow things down a little bit this weekend and not have anywhere we needed to be besides home. Whew! 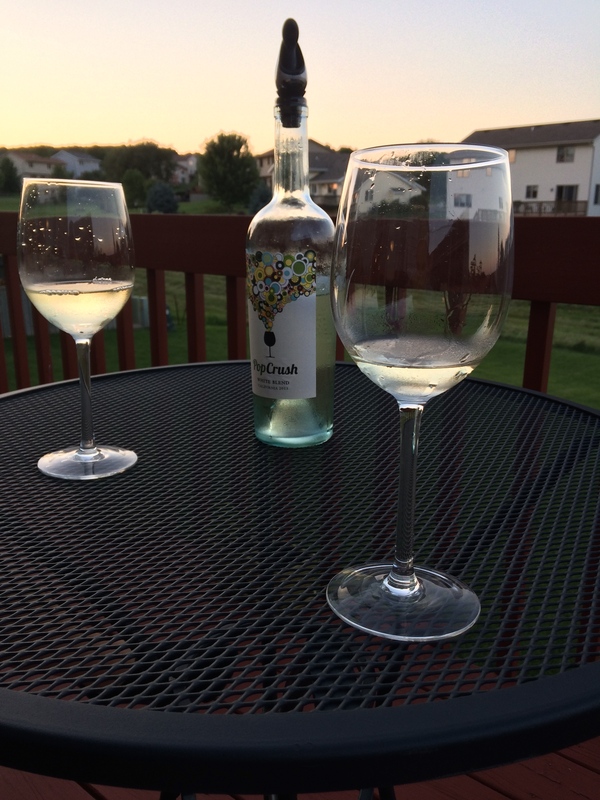 It had been a hot minute since we had time to sit out on our deck, put our feet up, and watch the sun set in the horizon. Life really is good. While today I feel caught up for the week (thanks to our catch-up weekend), last Monday was a completely different story. Trips always throw you off your schedule, don’t they? It was well worth it, but come Monday after being gone all weekend, I knew I had an empty fridge that needed to be filled and a meal to throw together after said fridge was filled up. By the time I came home from work and getting groceries, I was huuuung-ry. Going out to eat is usually not a default option for us, especially not when we’d been eating out at various places all weekend long. To wrap that all up: I needed something light & healthy (after a crazy weekend with lots of food) and fast & simple (because I needed to eat 5 minutes ago). My solution? 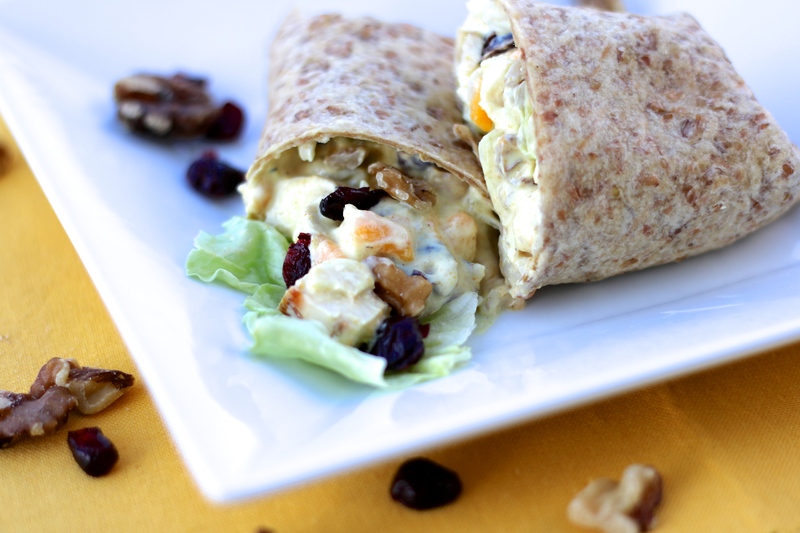 This flavorful, slightly-sweet Mango-Curry Chicken Salad. This salad is bursting with fresh flavor and is perfect for a packed lunch at work or a light dinner. Not to mention, it’s perfect for a crazy weeknight when time is not on your side. 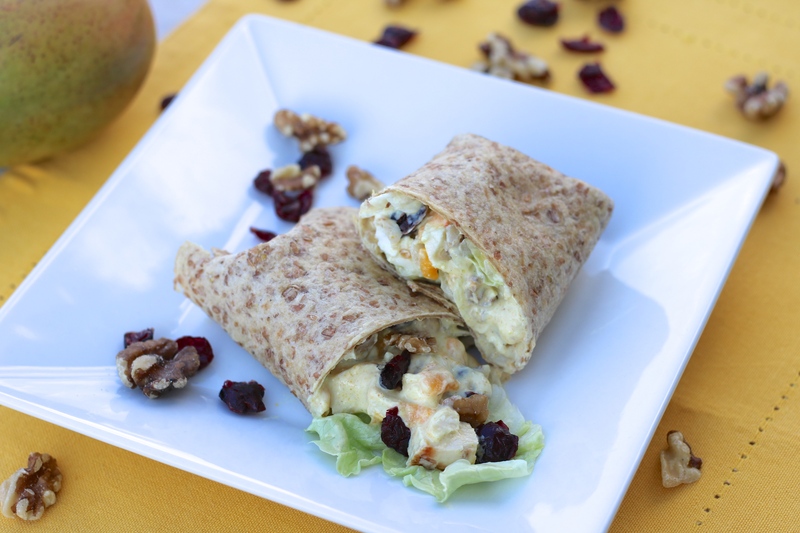 It’s delicious wrapped with lettuce in a whole-grain wrap like I made it, but it’s just as yummy in a lettuce wrap, on crackers, or even on it’s own (I’d be lying if I said I didn’t eat it straight out of the bowl…yum!). The thing with chicken salads — there are so many varieties! Why add another one? Well, this one tastes so uniquely different than any other salad, it’s a class of its own. At the same time, while it’s different enough to be one-of-a-kind, it still has the same basics to other chicken salads you’re more familiar with — so don’t shy away from this salad just yet! It still has the creamy base, except instead of mayonnaise, plain yogurt does the trick. 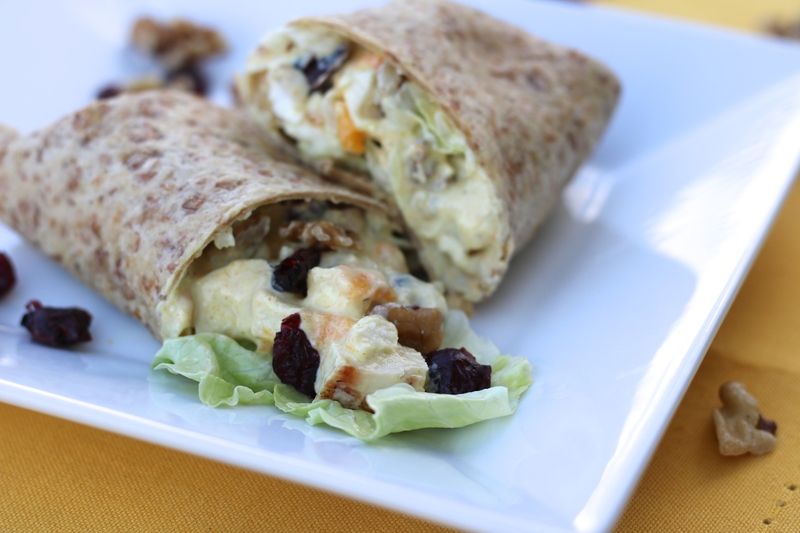 It is naturally sweetened with cranberries, which isn’t completely unlike other chicken salads. But this salad also has the sweetness and brightness of a ripe mango that makes you want to take another bite. And of course, this salad has a bit of curry to give it a whole new flavor profile. 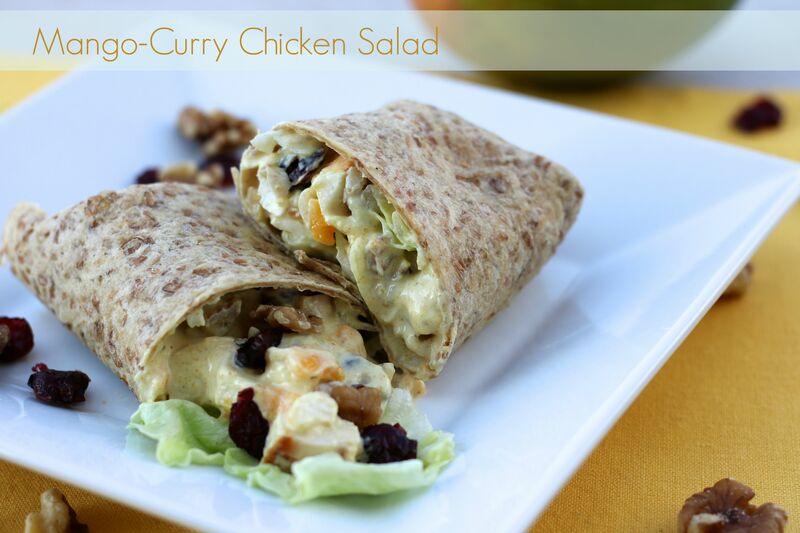 The curry is just enough to add some flavor, but doesn’t dominate the salad at all. If you don’t think you like curry, I’m willing to bet you’ll still enjoy this salad. Even though this salad came together in minutes, it was just as delicious and enjoyable as a meal I would spend an hour preparing. Philip and I savored every bite, had minimal clean-up, and avoided the hot debate of what restaurant to visit. From empty fridge to a meal on the table in 30 minutes — I’ll take that for a Monday night! In a medium bowl, blend yogurt and curry with a whisk. 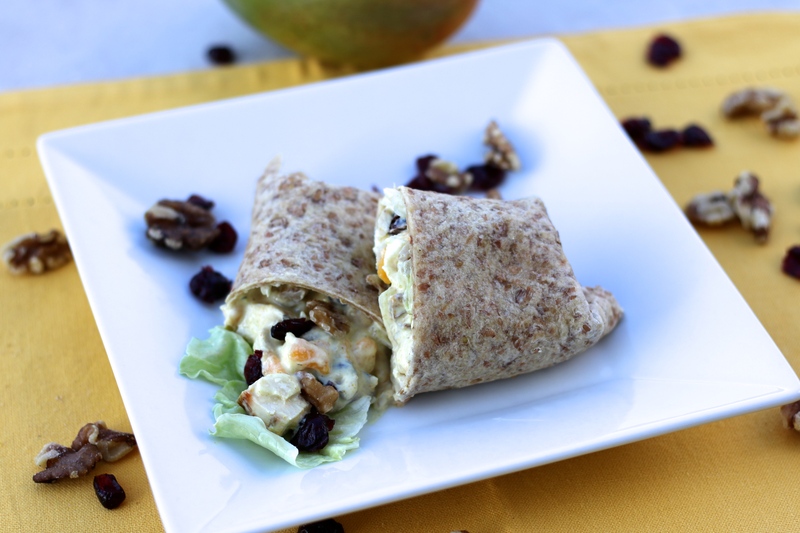 Stir in chicken, mango, cranberries, walnuts, and Mozzarella; mix well. 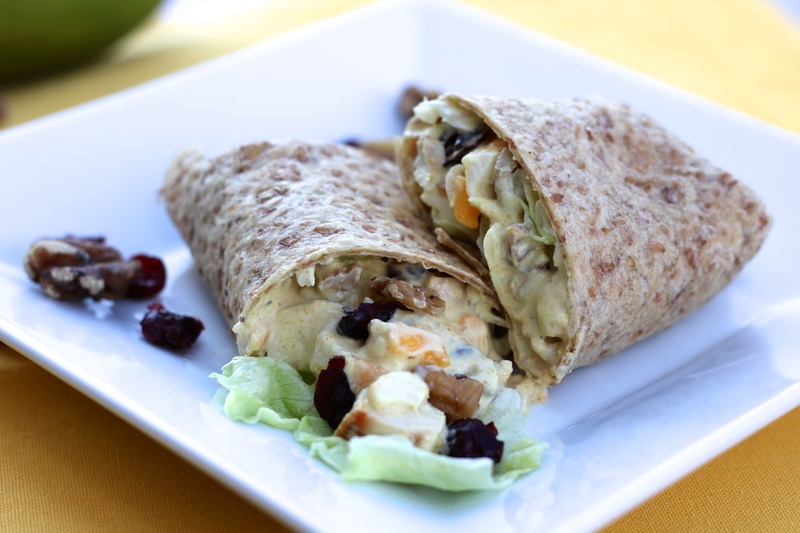 Serve in a whole-grain wrap, lettuce leaves, crackers, or enjoy by itself. Ooooo, the cheese is a nice touch! I’m adding this to my book of tricks!